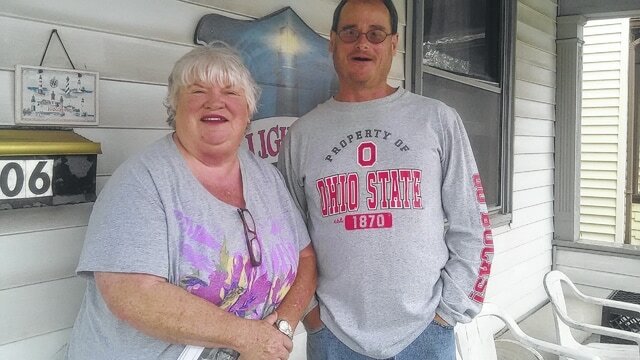 Donna Leuthold, the founder of the Lighthouse Homeless Shelter in Bucyrus, and Brian Wilson, director of the shelter, want to remind people that the shelter is available for men in need across the county and that donations are needed to keep the shelter open. BUCYRUS -The Lighthouse Homeless Shelter is alive and well. Founder Donna Leuthold said she has heard rumors that the shelter has closed. “We are still open for any man in the county who is homeless and needs a place to stay,” Leuthold said. Shelter director Brian Wilson said the home, located at 306 Woodlawn Ave., in Bucyrus has room for seven to nine men to stay until they obtain employment and permanent housing. “We try not to turn people away but if we are out of beds, we have no choice,” Wilson said. Leuthold, who opened the shelter eight years ago, operates the home on donations only. Leuthold said the home is owned by her son, Crawford County Municipal Court Judge Shane Leuthold, and has provided shelter for about 250 men over the past eight years. “We would like to open a shelter for women and children but need to make sure we have enough donations coming in to keep the doors open of Lighthouse first,” Leuthold said. Leuthold said if the shelter is full or women call for shelter, she refers them to shelters in Marion and Mansfield. Lighthouse is currently the only shelter in Crawford County. Wilson said criminal background checks are completed on new men entering the shelter. “If they have any kind of sexually-related charges they cannot stay here because of the fact the shelter is located across the street from a school (Bucyrus Elementary),” Wilson said. Leuthold said there are a list of rules that must be followed by the men who stay at the shelter. “They have a time they need to be in at night unless they are at work or it is otherwise pre-approved. There is no drinking or drug use allowed along with the usual rules of keeping the home clean and doing what they can to help out. We have several men who once stayed here and now are back on their feet again who donate money to the shelter to help others,” Leuthold said. For more information or to donate to the shelter, call 419-562-7873 or 419-563-4162.